Remi is a high school student who is cleaning her library with a broom one day. But when she dusts off an old book, it starts talking and she panics. The book, named Lore, is a magical spellbook that transports her to a magical realm infested with robots. Now it’s up to Remi and the magical book to fight off the horde of mechanical monsters to find the portal so Remi can go back home. RemiLore is a randomly generated hack and slash dungeon crawler action game, and it’s available to download for nearly all current game consoles, but reviewed on Switch here. I’ve always had a passing interest in stop motion and clay animation. In fact, one time in college I took a day-long just-for-fun clay animation class. It took us a whole day to make a few seconds of very choppy clay animation, so I have new respect for the folks who do that for a living! So I won’t pass up a chance to review a game that looks like it’s made entirely out of clay. 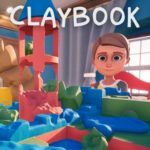 Claybook is a 3-D puzzle platformer where everything looks like it’s made of Play-Doh. It’s available on nearly all current game consoles, but reviewed on Switch here. So last we’ll look at the rest of the games on the vol. 3 collection of Atari games, these coming from the 2600. I have to say that I don’t have as much nostalgia for the 2600. I did play it a lot at friends and neighbors’ houses, but I didn’t own one myself until many years later. Plus I just don’t think most of the 2600 library is that good. I did like most of Activision’s games, and there were a few arcade ports that were decent, like Moon Patrol or Centipede. But most of the Atari made games just didn’t grab me. So if I gloss over a lot of these, now you know why. Anyway, let’s look at the games on here. Most of the previous Atari collections out there had just arcade games and 2600 games. So it’s kind of a big deal that this one includes 5200 games as well. I was especially excited when I found out about this, because technically, the 5200 was my first gaming console. So let’s take a look at the 5200 games on this collection! 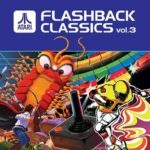 For Christmas I got the Atari Flashback Classics Vol. 3 game for PS4. I love classic game collections and writing about them, so for the next while we’ll going to take a look at the games on this compilation. There are so many though that we’ll do it in three parts. The first part we will take a look at the arcade games on here.